Another baby quilt | In the Crayon Patch.. I bought another template from Marti Michell: from her one-derful one patch templates series. 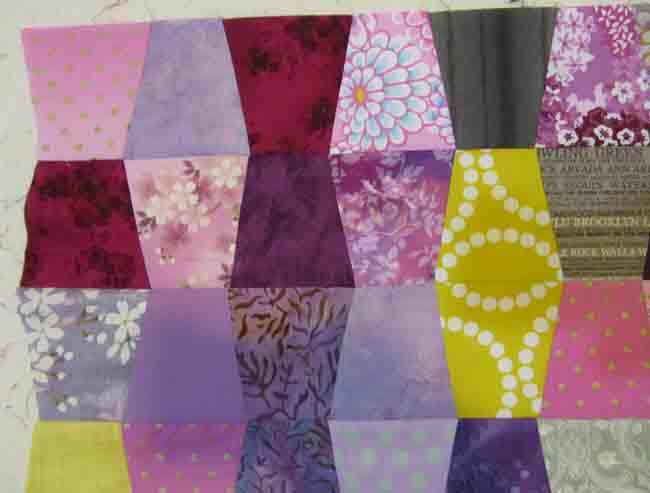 This one is the tumbler block, and so I decided to use it to make a quilt from my lovely purple yellow and grey fabrics. The special corners really made the quilt fit together well, but were a little fiddly to cut. I really should have used my cutting turntable for this project. I tried a totally random layout at first, but found it too busy. I ended up making a few “sets” of blocks, where the same fabric is used back to back. The close-up shows one such block in yellow, and most of one in purple near the bottom. And here is the fully-pieced baby quilt. I really love it- so simple to make, and it has a lot of visual interest. I especially like the colour combination. Quilting is my least favourite part of making a quilt, so it may sit there for a while as is… the “to be quilted” pile is going to topple over soon! Is there a mother out there who would use this for a baby boy, or is this a “girls only” quilt? I was so happy with my colour combination, thinking how fresh and original it looked. 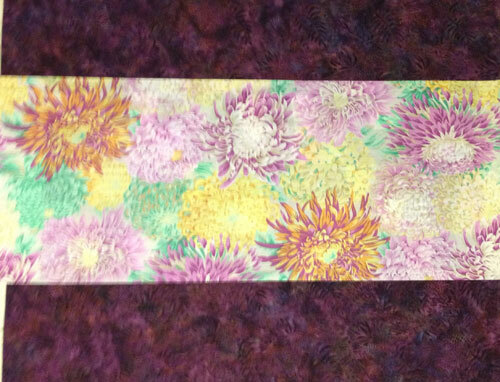 Then I went looking for a fabric to use as the backing, and look what I found… except for the turquoise, all the colours I used are in this Phillip Jacobs Japanese Chrysanthemums Pastel fabric. I love this fabric, and now see my quilt might have benefited from more pastel/ whites thrown into the mix. I’m not sure I have enough of the Phillip Jacobs fabric for the whole back, so I may use it to make a central panel, flanked by the dark purple.